Momma Told Me: You never know what's in store. Today is the first day in weeks where I've taken a deep breath and felt entirely myself. After weeks of fighting this season's flu, and a few tumultuous days of work and social affairs, I've emerged to that 'New Year's shine' everyone is so buzzing about. I'll admit, I have not been myself these past few weeks; and that did make the holidays rough- but here I am fresh and once again invigorated for all that lies ahead. In fact, we're kicking off 2016 with our first installment of a new blog series covering entirely random, picked at whim, 'National Day of Celebration' posts. 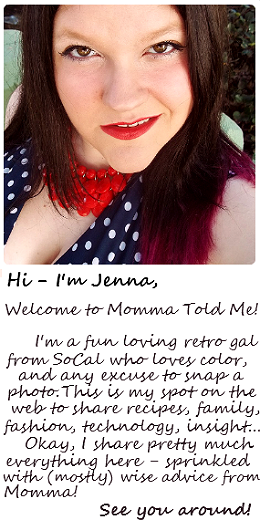 Every week in 2016 you can tune into Momma Told Me for a unique recipe or project celebrating something completely arbitrary based on a little known National holiday. While I so very much wanted to make some Wookiee Cream Puffs for National Science Fiction Day and National Cream Puff Day (January 2, 2016) I only just recovered in time for today's post. 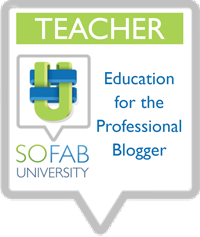 It's my hope, as we move through the year, that I will get the scheduling in order enough to share these fun recipes and crafts with you days, if not a week, in advance of the holiday so that you can follow along and celebrate too. 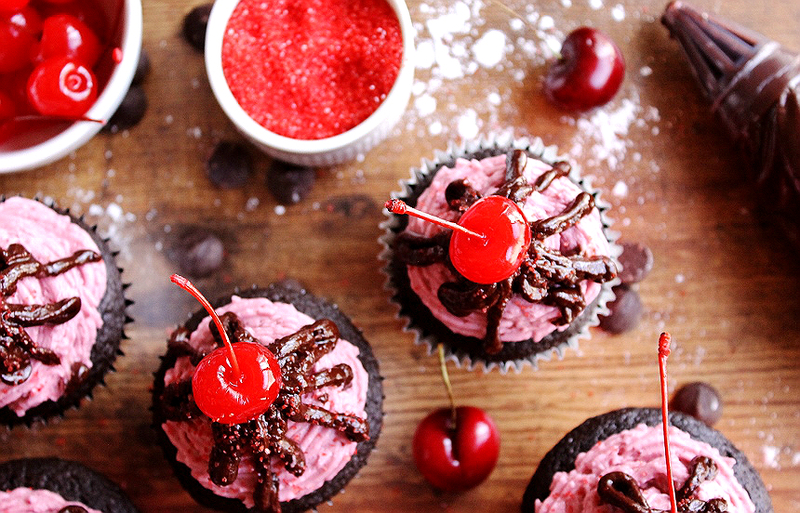 I'm a little late to the celebration this week- but these Chocolate Covered Cherry Cupcakes will taste just as good any other day of the year as well. I thought National Chocolate Covered Cherry Day (January 3rd, 2016) was a great fit for this week's feature because they are often associated with seasonal gifting. 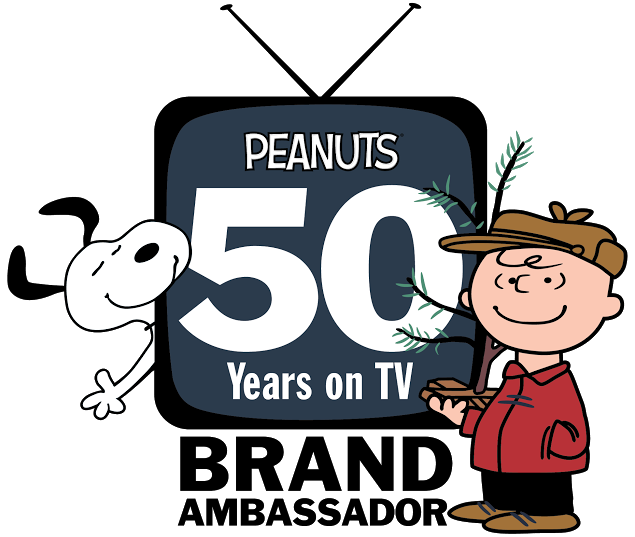 That is, you see them emerge on shelves early November for the holiday season, and find them appearing in heart shaped boxes come February. Now, there is some debate over what qualifies as a Chocolate Covered Cherry- most argue that cherries simply dipped in chocolate so not count, but we won't fault you for celebrating that if you wish. Yes, the 'real' chocolate covered cherries are actually a liquor style confection that is actually quite impressive to make. The technique for making such a candy with the perfectly liquid center, and sweet Maraschino core is actually rather frustrating- Believe me, I'll show you some time, I promise. The first Chocolate Covered Cherries, however, were introduced to the modern world in 1929 by Cella's Confections in New York. And the original recipe is still very much alive and in production 85 years later, surprisingly by Tootsie Roll. 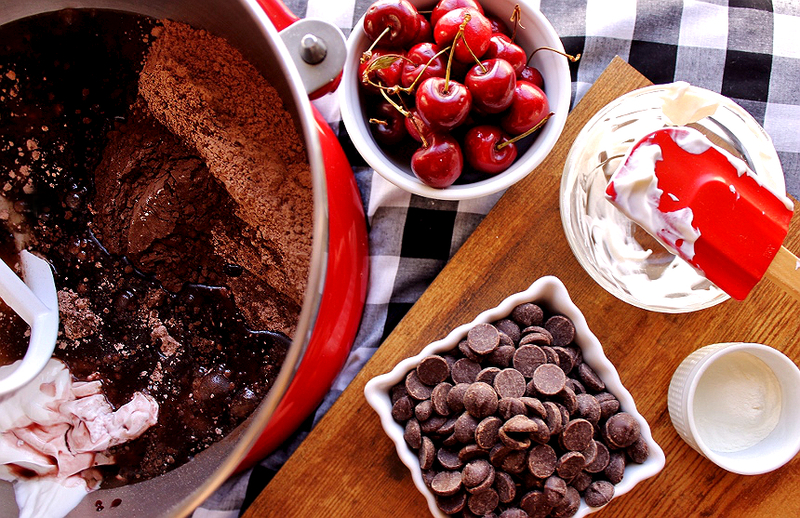 When it comes to chocolate covered cherries, themselves, you either love them or hate them. I, personally don't care for liquid, or cream, center chocolates and find the Maraschino cherries featured inside this confection are too syrup sweet for my tastes. But the combination of chocolate and cherry? A classic winner without a doubt. 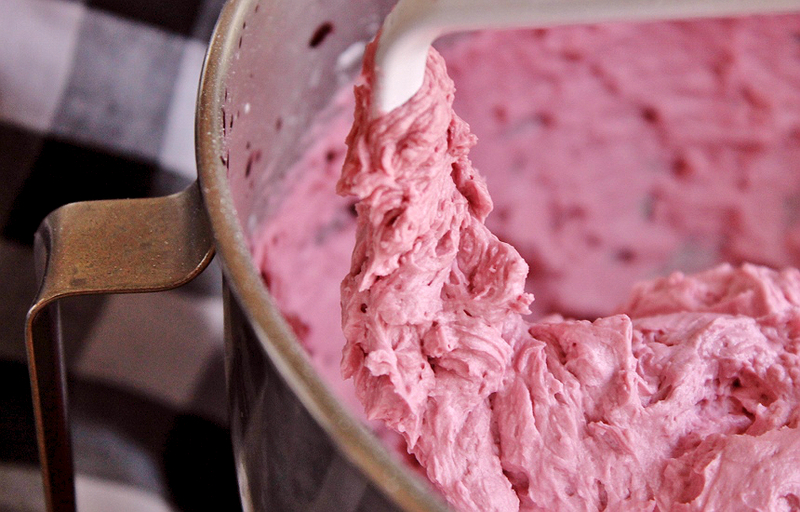 Black Cherry Chip ice cream remains one of my all time favorite 31 Flavors varieties. There's something about the tart bite of real cherry juice that plays up the bittersweet notes of cacao that I find intoxicating. 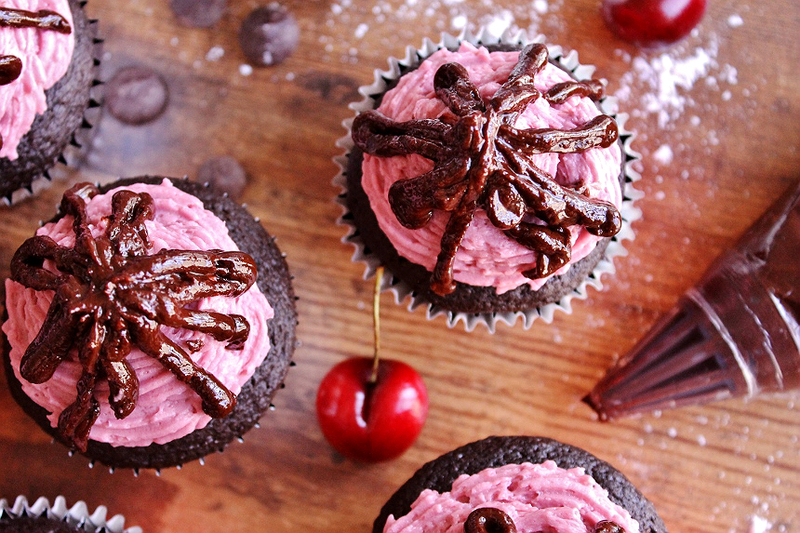 So, I offer you this Chocolate Covered Cherry cupcake recipe, which reminds me of my Cherry Cola Cupcake recipe- but has an entirely different flavor and sophistication. The secret's in the real Organic tart cherry juice, reduced down to a syrup for a heavenly buttercream frosting that's every bit as surprising as the center of a real chocolate covered cherry. Of course, we added some cherry to the cupcakes as well- but it didn't quite draw out as much beautiful color as I'd liked. 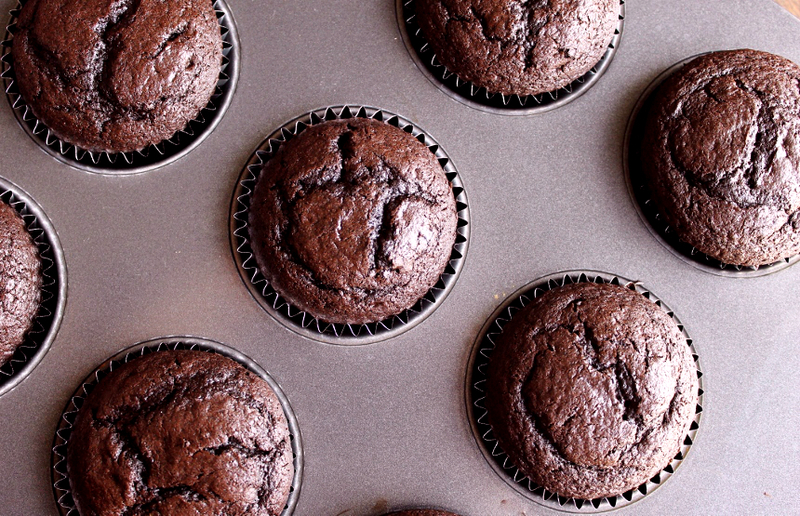 In the interest of cutting back on artificial colors, we kept this recipe au-natural. 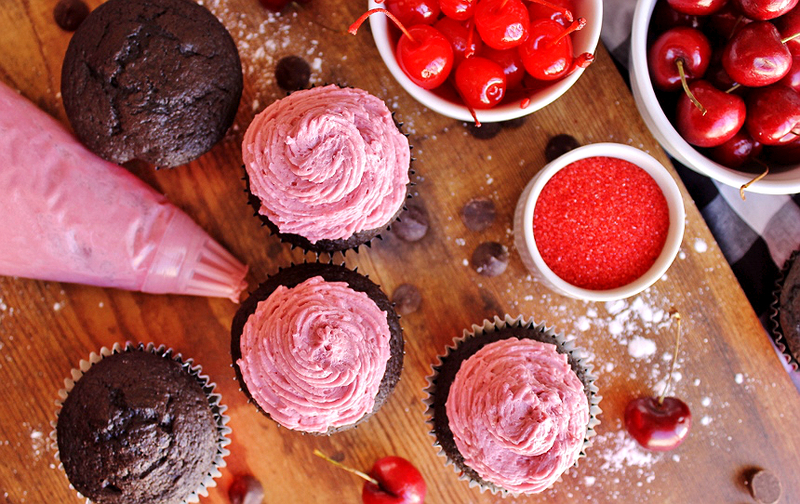 If a decadent dark chocolate devil's food cherry infused cupcake topped with a mountain of tart cherry buttercream frosting isn't enough we've added a cherry on top (quite literally) with a simple semi-sweet ganache and stemmed Maraschino cherry. I'd made this recipe prior with a liquor sponge style base- but find this alcohol free variation is just as moist and actually draws the cherry flavor out more than the original. 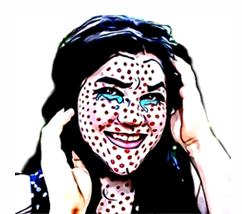 Does the world really need a Chocolate Covered Cherry day? No- but all of those boxes of cordial cherries sitting on holiday clearance shelves might argue yes. For now, I'm content enjoying the celebration with a foil wrapped and some chocolate crumbs. 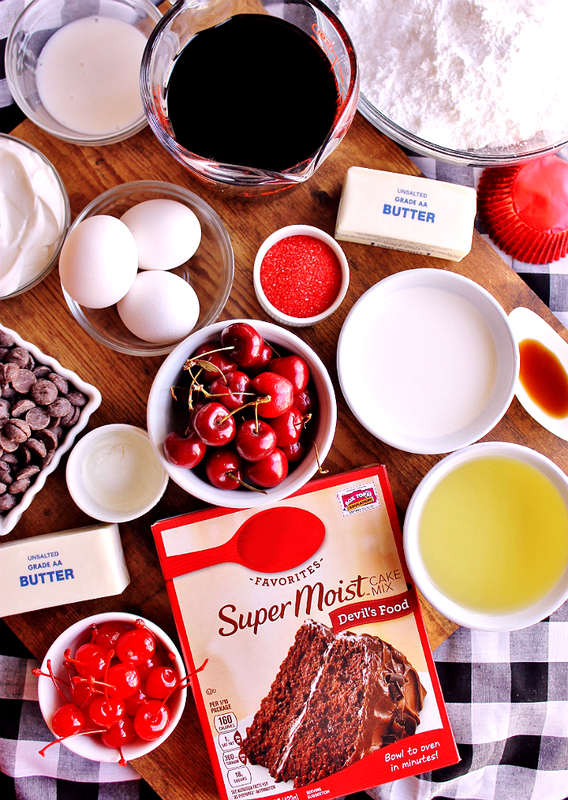 This would be a wonderful Valentine's recipe *hint, hint* but really, it's just a deliciously fun way to dress up a classic devil's food cake. You can even use the boxed cake mix as a base- I'm not telling! Now dish- Do you like chocolate covered cherries or are you more of a chocolate dipped cherry fan? 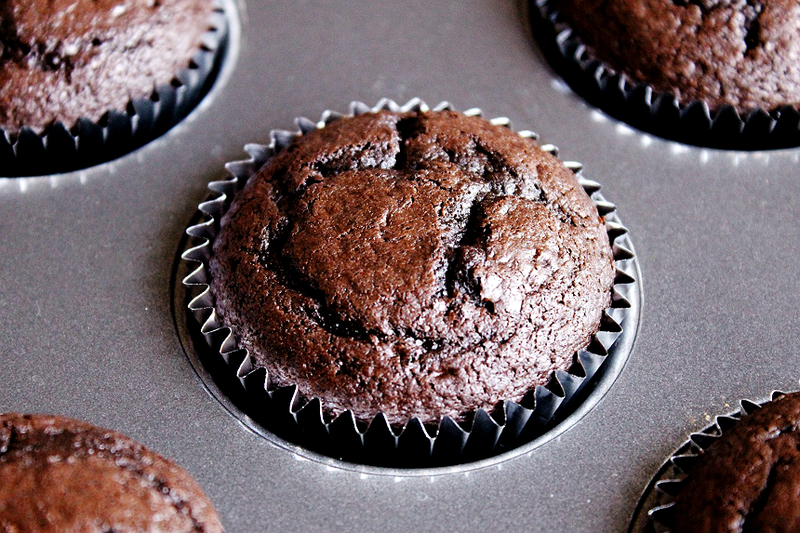 What Daughter Says: Life may be like a box of chocolates, but these cupcakes never disappoint! 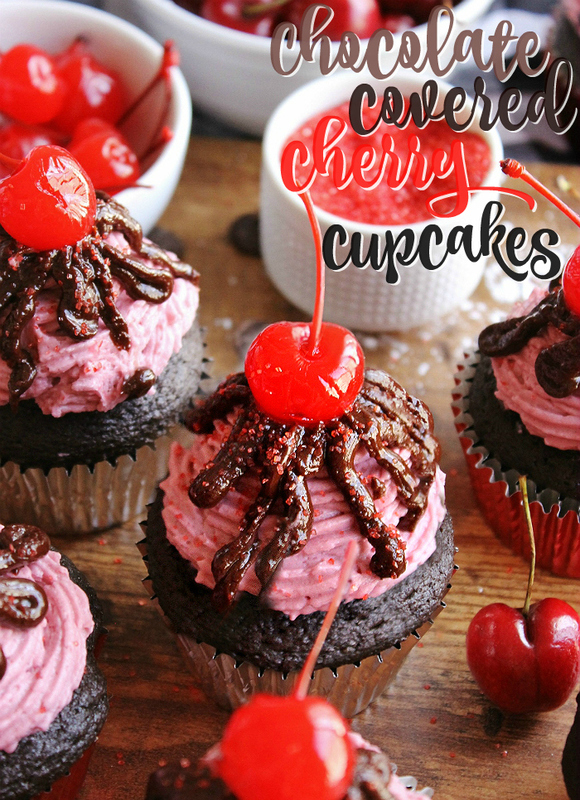 ***Click here for printable Chocolate Covered Cherry Cupcakes recipe. 1. Pour 1 C Cherry Juice in a medium saucepan and heat over medium-high heat until reduced to 1/3 C (about 12015 MINS.) Allow to cool to room temperature. 2. 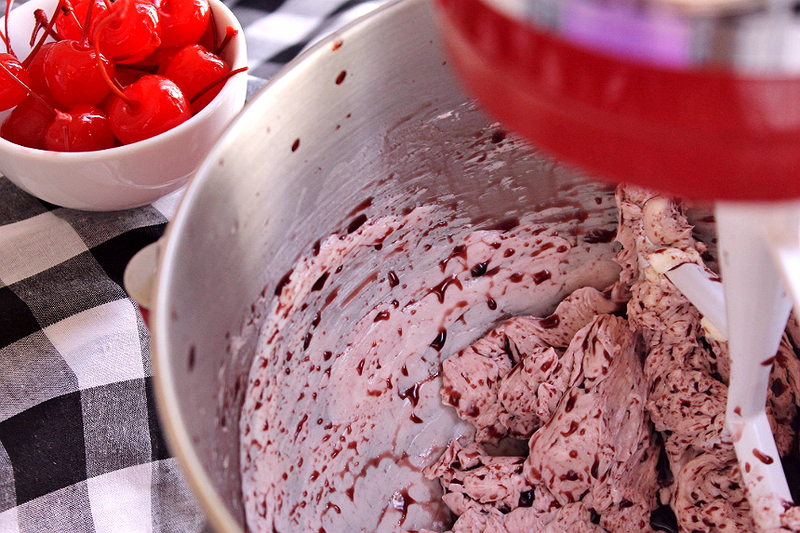 Beat softened butter ans cooled cherry syrup in the bowl of a stand mixer, with paddle attachment to combine. In a separate bowl combine Meringue powder and confectioner's sugar. Add gradually to the bowl of the mixer, on low speed, until incorporated. Add the vanilla, and a portion of milk to help moisten the buttercream mixture. Whip on Medium speed for 4-5 minutes, adding the remainder of milk as necessary, until a smooth and creamy buttercream texture is achieved. Refrigerate Overnight. 3. Preheat Oven to 350F. Line 2 cupcake pans with 24 liners. 4. 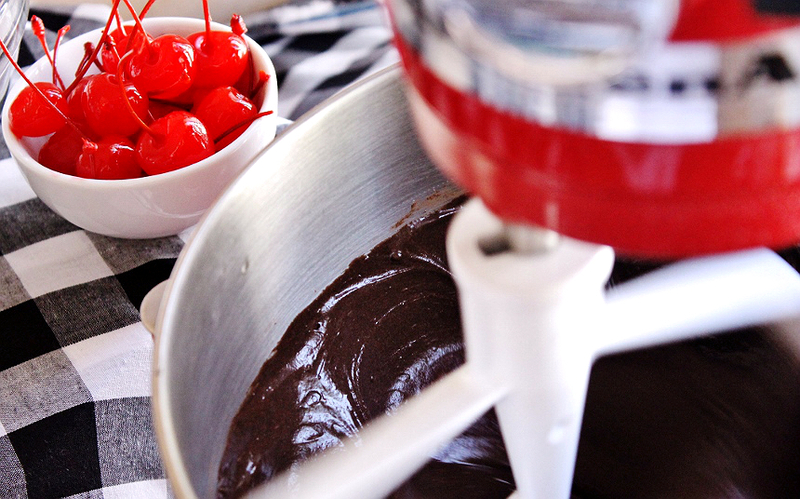 In the bowl of a stand mixer with a paddle attachment combine the cake ingredients on low speed. Once combined, mix for 3 minutes on medium. Portion the batter evenly into the prepared muffin tins, about 3/4 full. Bake for 14-16 MINS at 350F, or until a toothpick inserted comes out with moist crumbs. Allow to cool in pan for 2 MINS before transferring to a wire rack to cool. 5. 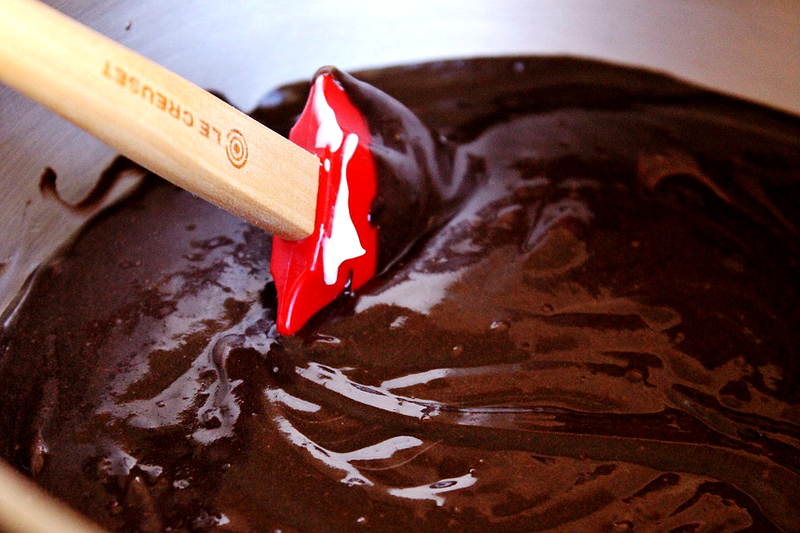 While cupcakes bake prepare your ganache by heating cream in a small saucepan just until simmering. 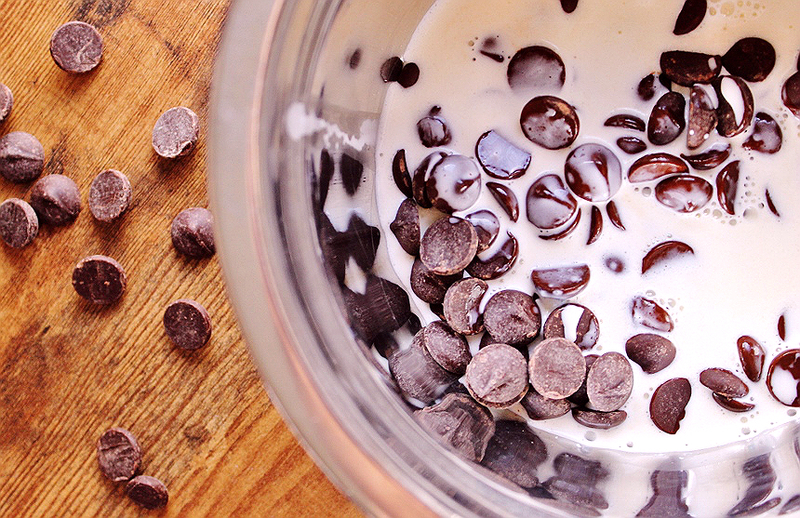 Pour hot cream over chocolate chunks/chips in a heat safe bowl and cover. Set aside for 5 MINS. Uncover and mix thoroughly until smooth and creamy. 6. 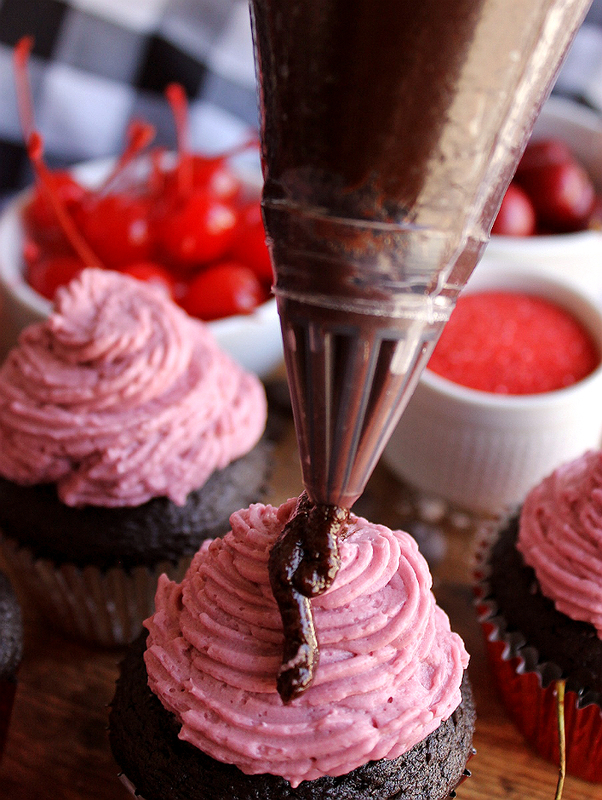 Place both the cherry buttercream and ganache in separate piping bags. Pipe cooled cupcakes with cherry buttercream and drizzle with ganache. Sprinkle red sparkling sugar as desired and top with a stemmed Marschino cherry. This looks like such a fun and pretty recipe. My brother loves chocolate covered cherries. I should make these for his birthday! I think this is the best "day" ever. 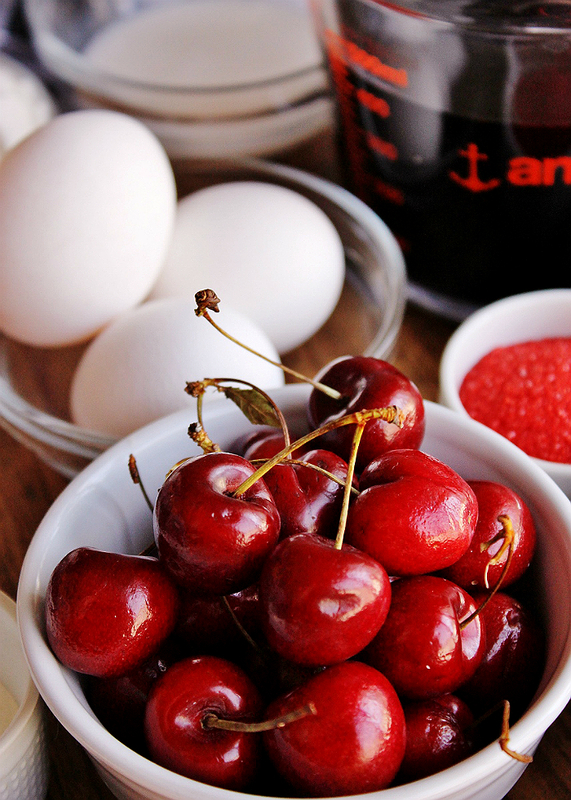 All foods should look this good and have cherries and chocolate in them! Yum! These are something my middle child would love he is all about his cherry desserts and snacks! I will have to try to make these as a surprise for him. Those look so good! My family loves chocolate and cherries together.